The term Internet Protocol address or more commonly known as an IP address definitely needs no introduction to most people. It is a unique number that devices use in order to identify and communicate with each other on a computer network. With DNS Lookup API from WhoisXmlApi, users can easily map a domain name to its IP address. While knowing the IP address can have its uses, many professionals need to know the real world location of the IP address as well, be it to detect online fraud or to locate online visitors. This is now possible with Geolocation technology, which helps determine the physical, real-world location of a person or device using IP address. 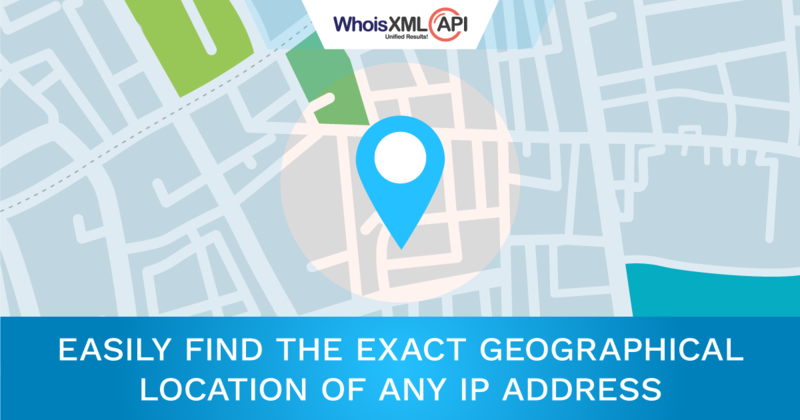 And we at WhoisXmlApi are proud to venture into this arena with the release of our latest product IP Geolocation API, which caters to just that! There are times when you need to identify where your web visitors are coming from. You might have an e-commerce website, and would like to know where your potential customers are located, pre-populate country code on forms, display different language or currencies and reduce credit card fraud based on geographic location. Or, you might want to fight against illegal spammers and hackers and would like to locate the source of a problem. Knowing the location of internet users can help professionals from different industries in many ways including website content personalization, fraud detection, ad targeting, traffic analysis, compliance, geo-targeting, geo-fencing and digital rights management. With IP Geolocation you can be rest assured to get 100% accurate location information & more for IP addresses across the world in real-time!